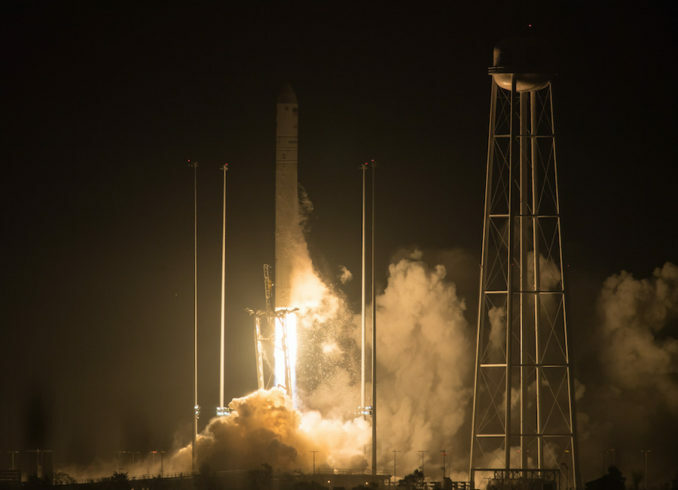 An Orbital ATK Antares rocket streaked into orbit early Monday from Wallops Island, Virginia, with a commercial Cygnus cargo craft carrying a quantum research experiment, an investigation into the properties of concrete in space, fresh food and other provisions for the International Space Station’s six-person crew. It was the 200th mission to blast off for the International Space Station since the research facility’s first module flew into orbit in November 1998. 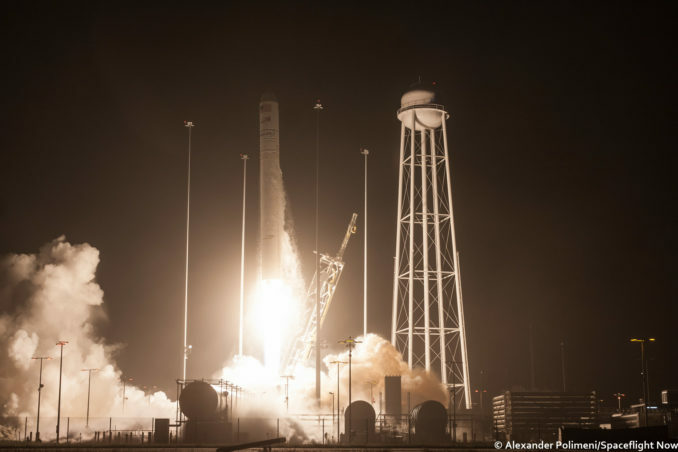 The two-stage launcher ignited its two Russian-made RD-181 main engines at 4:44:06 a.m. EDT (0844:06 GMT) Monday, and the Antares rocket lifted off a few seconds later from pad 0A at the Mid-Atlantic Regional Spaceport on Virginia’s Eastern Shore. Riding a column of flame from its kerosene-fueled twin-engine first stage, the 139-foot-tall (42.5-meter) Antares rocket climbed through broken cloud layers and pitched southeast over the Atlantic Ocean after liftoff, which occurred five minutes later than scheduled to allow for threatening clouds to move out of the launcher’s flight path. Liftoff was previously pushed back from Sunday to allow for better weather and additional time for pre-flight inspections. The two RD-181 engines, generating a combined 864,000 pounds at full throttle, powered the rocket and its supply ship payload downrange from the Virginia launch base, located on NASA property at the Wallops Flight Facility on the Atlantic coastline. 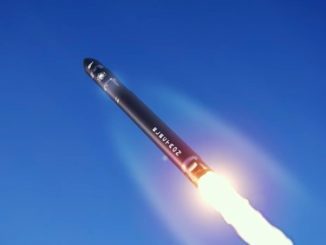 The first stage, manufactured in Ukraine, switched off and jettisoned around three-and-a-half minutes after liftoff, then the Antares rocket released a shroud covering the Cygnus spacecraft before igniting a solid-fueled, U.S.-made upper stage to send the logistics carrier and its 7,385 pounds (3,350 kilograms) of cargo into orbit. The automated supply ship separated from the Antares upper stage around nine minutes into the mission, then unfolded two fan-shaped solar panels to start generating electricity, and conducted its first orbit-raising burn to commence a three-day pursuit of the space station, kicking off Orbital ATK’s ninth resupply run to the international research facility. The Cygnus spacecraft is set to arrive at the space station early Thursday. 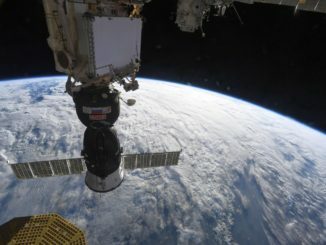 Astronaut Scott Tingle will take command of the station’s Canadian-built robotic arm to grapple the supply ship around 5:20 a.m. EDT (0920 GMT) Thursday, and ground controllers will maneuver the cargo vehicle to a berthing port on the Unity module for a nearly two-month stay. A commercial deployment platform provided by NanoRacks, a Houston-based company that brokers opportunities for researchers to send their experiments into space, is mounted outside the Cygnus spacecraft to release six tiny CubeSats in orbit after the supply ship departs the space station in July. The NanoRacks deployer, and the CubeSats contained inside, weighs around 181 pounds (82 kilograms), giving the OA-9 mission a total “upmass” of 7,385 pounds (3,350 kilograms), according to a NASA fact sheet. Once Cygnus arrives at the station, astronauts will unpack equipment stowed inside the supply ship’s internal compartment, transferring hardware to storage locations and research racks housed inside lab modules on the orbiting outpost. Scientists plan to use one of the experiments launched aboard the Cygnus supply ship to explore the nature of ultra-cold matter, probing the behavior of atoms chilled to extreme temperatures colder than the vacuum of space. The Cold Atom Laboratory, developed by NASA’s Jet Propulsion Laboratory, will spend at least three years serving as a platform for quantum experiments. 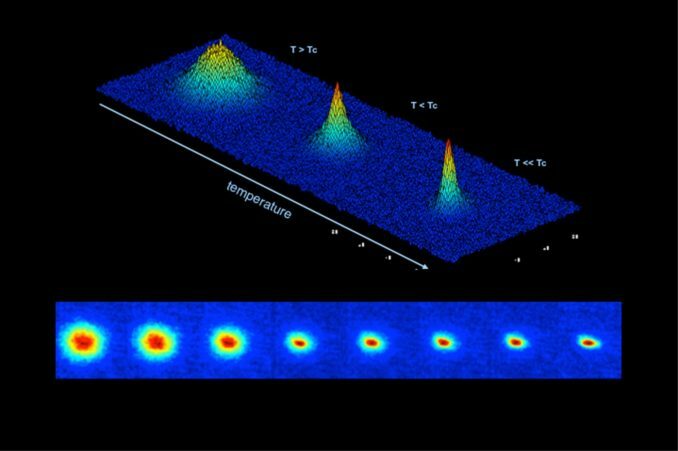 The chilling conditions inside the Cold Atom Laboratory will slow the movement of atoms until they are almost motionless, forming Bose-Einstein condensates, a low-energy state of matter where atoms become synchronized and exhibit characteristics of a single continuous wave, rather than individual particles, according to NASA. Research into Bose-Einstein condensates on Earth are limited by the effects of gravity, which causes atoms to settle to the ground in a fraction of second. In space, high-resolution imagers inside the Cold Atom Laboratory could observe the behavior of the condensates for up to 10 seconds in free fall, allowing scientists to probe their properties and study fundamental quantum mechanics that could find applications in miniaturized technology, atomic clocks and quantum computers. Scientists will command the Cold Atom Laboratory from the ground while the crew sleeps, minimizing interference and accelerations from astronaut activity that could mask the facility’s precise quantum measurements. Another science experiment launched Monday will study the solidification of cement in microgravity. Concrete could be a “go-to” material to build such shelters, she said. “In our research, we actually look into how cement reacts with water, and how this very complex process of microstructure formation happens in space,” Radlinska said. Radlinska’s team sent up multiple pouches with cement and water for astronauts to mix on the space station. The samples will come back to Earth for comparison with the results obtained from similar pouches mixed on the ground, according to Juliana Neves, a graduate researcher on the experiment at Penn State. A commercially-developed device launched aboard the Cygnus mission Monday will test a method of separating liquids in microgravity for Zaiput Flow Technologies, a Massachusetts-based company. The mechanism will use surface tension, instead of gravity as used on Earth, to separate water from an organic solvent, demonstrating a method that could be employed by future expeditions synthesizing chemicals in space or on another planet to produce water and rocket fuel. The Cygnus supply ship will also deliver equipment for astronauts to install outside the space station on a spacewalk scheduled for June 14, and engineers will demonstrate the first use of a new communications system that will allow the station crew to establish radio links with Cygnus during the final approach Thursday. The same proximity communications system will be used by Boeing and SpaceX commercial crew vehicles as they rendezvous with the orbiting complex. Nine CubeSats packaged inside the Cygnus pressurized cabin will be transferred into the station’s Japanese Kibo lab, where astronauts will place them in an airlock for retrieval by a robotic arm, which will position the nanosatellites for release into orbit in the coming months. CubeRRT, a 6U CubeSat developed at Ohio State University with NASA funding to test a new signal processor to mitigate radio interference impacting microwave radiometer measurements of soil moisture, atmospheric water vapor, sea surface temperature and winds from orbit. EQUiSat, a 1U CubeSat developed by Brown University with NASA support as an educational outreach mission, with a secondary objective of demonstrating a new type of battery in space. HaloSat, a 6U CubeSat developed at the University of Iowa in partnership with NASA to detect X-ray gas emissions around the Milky Way galaxy. MemSat, a 1U CubeSat developed at Rowan University in partnership with NASA, will test a memristor device that could be flown on future satellites to make them more energy efficient and more resilient to power failures. RadSat-g, a 3U CubeSat developed at Montana State University in partnership with NASA, will test a new radiation tolerant computer system. 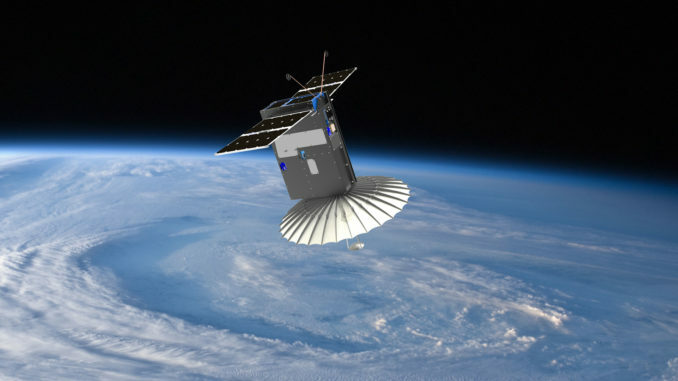 RainCube, a 6U CubeSat developed at NASA’s Jet Propulsion Laboratory, will demonstrate the viability and performance of a new expandable Ka-band precipitation radar that can be packaged into a volume to fit in a nanosatellite. TEMPEST-D, a 6U CubeSat developed at Colorado State University in partnership with NASA, is a risk mitigation mission for a planned constellation of Earth observation CubeSats that will track the steps in the formation of clouds, precipitation and storms. EnduroSat One, a 1U CubeSat developed in Bulgaria, carries an amateur radio payload. Radix, a 6U CubeSat owned by a commercial company known as Analytical Space, will test a laser communications terminal planned for use on a future constellation of orbiting data relay nanosatellites to enable high-speed optical downlinks to Earth. The Cygnus spacecraft is named for J.R. Thompson, the former chief operating officer at Orbital Sciences Corp. who died last year. Thompson served in multiple management positions at Orbital, overseeing development of the Antares rocket and other vehicles in the company’s launcher family. He had a lengthy career at NASA before joining Orbital Sciences, including stints as the space agency’s deputy administrator and as director of the Marshall Space Flight Center in Huntsville, Alabama. Thompson was manager of the space shuttle main engine development project at Marshall in the 1970s, and he previously served as a liquid propulsion systems engineer on the J-2 engine that flew on the Saturn 5 moon rocket. Before the Cygnus spacecraft’s planned July 15 departure from the station, it will conduct a brief maneuver to reboost the research lab’s orbit. It will be the first time a commercial U.S. cargo vehicle has attempted a space station reboost, a capability currently only provided by Russian spacecraft. Visiting space shuttles and Europe’s Automated Transfer Vehicle also provided reboost services before their retirement. The orbit-raising maneuver will only nudge the space station into a slightly higher orbit, and mission planners have penciled in the reboost demonstration for a time when the research complex is already in the proper orientation for the maneuver, soon after the docking of a Russian Progress cargo freighter in early July. At that time, the Cygnus spacecraft’s main engine, which faces Earth during most of the ship’s stay at the space station, will be aligned roughly parallel with Earth’s surface with the station’s direction of travel, or velocity vector. After leaving the space station, Cygnus will fire its engine to climb into a higher orbit, to an altitude of roughly 310 miles (500 kilometers), for deployment of six more CubeSats. The final CubeSat deployments include four “Lemur-2” payloads for Spire Global, which builds and operates a fleet of nanosatellites surveying Earth’s atmosphere and tracking maritime traffic. The Aerospace Corp.’s AeroCube 12A and 12B spacecraft will also be released to demonstrate new star-tracker imaging sensors, a variety of nanotechnology payloads, advanced solar cells, and an electric propulsion system on one of the two satellites, according to NanoRacks, which provided accommodations for the CubeSats on the Cygnus mission. At the end of the mission, Cygnus will drop out of orbit and burn up over the South Pacific Ocean with several tons of trash no longer needed on the space station. Orbital ATK is one of two current providers of commercial resupply services to the station through a contract with NASA. 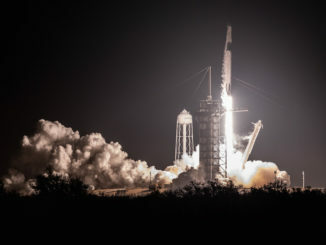 The agency’s other cargo transportation provider, SpaceX, has launched 14 operational logistics missions to date, and both companies have suffered one launch failure during a resupply flight.